1 1/4x 2 1/4x 2 7/8" long very clear and bottom-veiled multi-terminated Arkansas rock crystal cluster features a tantric twin. 1/2 of this twin is a laser crystal with an impossibly rare diamond window as one of the 6 main faces...a diamond window is rare enough as a 7h face! 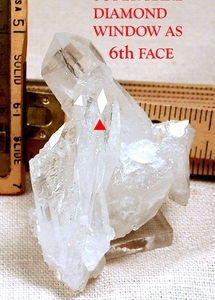 Missing crystals at the base of an elongated shield faced crystal [rare, 6 edged face] accentuate its' curving multi-terminated base. There is a rainbow foil with the most pleasing colors inside, and more rainbows along the row.